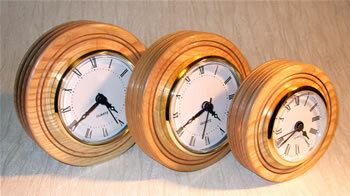 With the exception of the small Beech ball at the bottom of this screen, all these clocks have been made from Ash. This has been done to show the many mechanism types that are available. 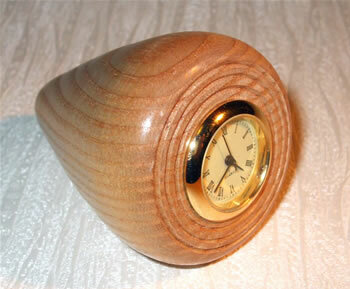 Using the same wood for each piece prevents differing colours playing a part in the apperance of the range. This group of 3 ranges from 95mm up to 120mm diameter. This small watch face is set into the base of a cone measuring 65mm from front to back. This small blue faceted dial measures 60mm overall. Its design follows the same basic, simple principals of others in the series. Centre stage has to be given up to the skeleton clock. 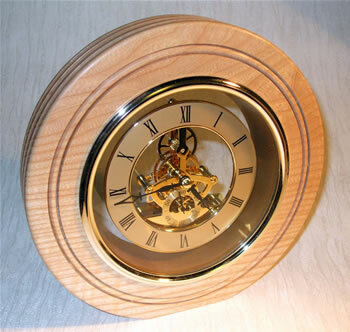 Measuring 220mm overall diameter, it was a close decision as to whether it should be made as a wall clock or free-standing. 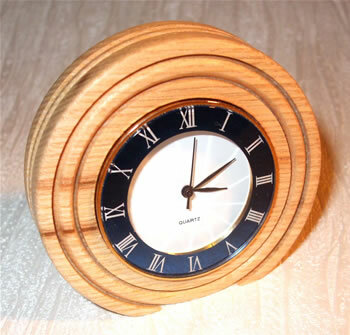 In the end, it was decided that as a wall clock, a lot of it's impact would be lost. 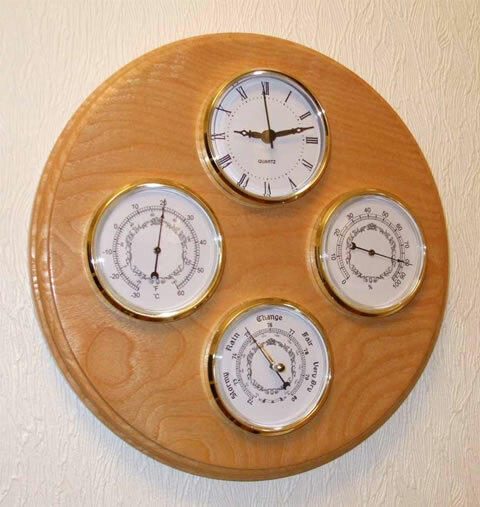 As can be seen from the weather station, clocks can also be incorporated into pieces containing a variety of weather instruments. This piece has a matching barometer, hygrometer and thermometer. The instruments can be mounted in any combination as required. 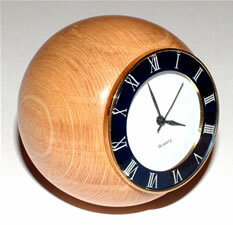 The final piece is another small clock with a blue faceted face. Breaking away from the overall theme of this page, it is mounted in the front of a Beech ball. It can be used as either a desk clock or a paper weight.